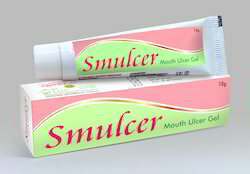 Leading Exporter and Manufacturer of Dental Products Range such as Herbal Mouth Ulcer Gel - Smulcer Gel and Pure Herbal Mouthwash - Fresho Mouthwash from Ahmedabad. Packaging Size 10 gm Lammi Tube with Carton. Indications : Inflammation of oral mucosa, Aphthous stomatitis, recurring stomatitis of unknown etiology, ulcer on the cheeks, Tongue and Lips. Packaging Details: 10 gm Lammi Tube with Carton. PRESENTAION : Pet-Bottle of 100 ml with attractive outer pack. Baval Gum (Acacia arabica) (A.B.) 30 mg.
Neem Bark (Azadirachta indica) (A.B.) 30 mg.
Pilo kantasherio Panchang (Barleria prionitis) (A.B.) 30 mg.
Tulsi Panchang (Ocimum sanctum) (A.B.) 30 mg.
Yashtimadhu Roots (Glycyrrhiza glabra) (A.B.) 30 mg.
Anant Mool (Hemidesmus indicus) (A.B.) 20 mg.
Karanj Bark (Pongamia pinnata) (A.B.) 20 mg.
Kayphal Bark (Myrica nagi) (A.B.) 20 mg.
Kutaja Bark (Holarrhena antidysenterica) (A.B.) 20 mg.
Manjistha Roots (Rubia cordifolia) (A.B.) 20 mg.
Mayaphal Galls (Quercus infectoria) (A.B.) 20 mg.
Pudina Leaves (Mentha arvensis) (A.B.) 20 mg.
Amala Fruits (Phyllanthus emblica) (A.B.) 10 mg.
Chanothi Leaves (Abrus precatorius) (A.B.) 10 mg.
Elayachi Fruits (Elettaria cardamomum) (A.B.) 10 mg.
Haritaki Fruits (Terminalia chebula) (A.B.) 10 mg.
Kankol Fruits (Piper cubeba) (A.B.) 10 mg.
Lavang Buds (Caryophyllus aromaticus) (A.B.) 10 mg.
Taj Bark (Cinnamomum zeylanicum) (A.B.) 10 mg. Indications : For inflammatory conditions of the Mouth & Pharynx caused by bacteria. Bad Breath, Stomatitis, Prevention & Prophylaxis of Gingivitis, Apthous ulcers, Dental & Gum inflammatory conditions, Maintenance of oral hygiene. Packaging Details: Pet-Bottle of 100 ml with attractive outer pack.